They say that a customer talking about their experience with you is worth ten times that which you write or speak about yourself. 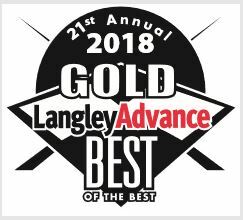 So, it’s with gratitude and appreciation that we thank our local community for voting us Gold as the Best HVAC Company in Langley! Gandy Installations have been servicing the Lower Mainland for over 60 years and to be recognized like this by our customers makes us feel like we are doing business right. Knowing that we are rated one of the top businesses in Langley is a real sense of accomplishment. We are very proud to be a part of this vibrant community. Through three generations, we have been providing HVAC services to Langley and the surrounding communities, covering a large area from Vancouver to Hope. From all of the staff at Gandy, thank you for making us feel special in what we do!